What happens when a prolific, thriving visual artist collides head-on with a recession, and her creative voice leaves the building? How do you bring disenchanted muses back to the bargaining table? What does it mean to go from making a living, to making a life? In 2007 when the U.S. sub-prime mortgage crisis was still only a glint in Fanny Mae’s eye, Canadian painter Sheila Norgate was riding the crest of a wave. Defying the art-world gender gravity that rendered the work of women under-represented in galleries, under-collected in museums, and underpaid at auction, Norgate was making a decent living solely from the avails of her art practice. Demand for her work had steadily grown and she was averaging two or three exhibitions each year. Then, within one dizzying eight month span, starting in the spring of 2008, the scaffolding of her carefully constructed career started to collapse, taking with it much more than her financial livelihood. Somewhere along the line, her sense of value and worth had become laminated with success, and as this so-called success began to fade, she lost her footing on the loose gravel of false ground. However, a funny thing happened on her way to the floor; it might have been global economic woes that toppled the house of cards she was living in, but it was Grace that showed her what she needed to learn while she was down there. 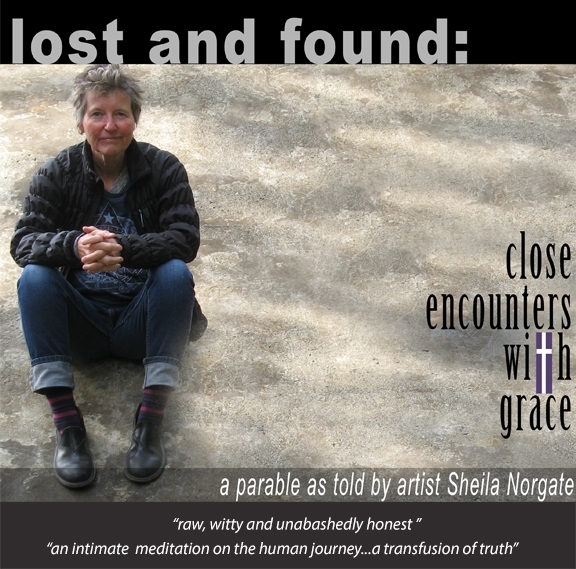 Join Canadian painter Sheila Norgate in this frank and powerful exploration as she shares her journey through the crucible of loss, and emerges on the other side with a whole new way of seeing. Sign up to receive my e-newsletter which I promise to make so interesting, you’ll be waiting for it like my maltese poodle waits for dinner.